In distinctive ways, Iran is one of the most photogenic countries in the world — a place where dazzling architecture is set amid desolate expanses of desert or steppe; where snow-capped mountains plunge dramatically to a seacoast of steamy lushness; where nomads guide their flocks to seasonal pasturelands; where tombs, temples, castles, and mosques bespeak the richness of the Persian past. High and dry for the most part, the land is sectioned by great mountain ranges, dotted with venerable villages of mud and stone as well as modern cities, and has a cultural fabric woven of many different threads — Persian,Turkic, Kurdish, Baluchi and even Mongol. For a photographer to capture such a mix of spectacular terrain and cultural complexity is a formidable challenge, one that Daniel Nadler, an American born in Egypt, has met brilliantly in Iran the Beautiful. 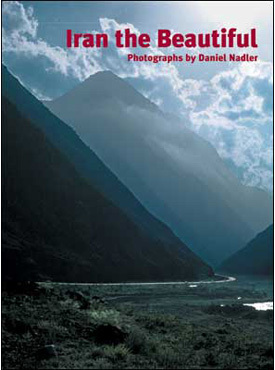 This book, comprising more than 170 photographs, takes as its symbolic center the magnificent landmark of Mount Damavand, the highest peak in the Middle East, and ranges outward from there north to the Caspian Sea, east as far as Gonbad-e Kavus, west toward Zanjan, and south to Isfahan. All lie no more than a day’s drive from the great volcano, yet within those bounds can be found a spectrum of landscapes, lifestyles, and architectural treasures that show why Iran, once seen, can never be forgotten. Daniel Nadler is an American engineer who was born in Egypt to European parents. A passionate photographer all his life, Nadler is a graduate of Cornell University and has traveled throughout the world as a construction manager. He is the author and photographer of China to Order: Focusing on the XIX Century and Surveying Polychrome Export Porcelain Produced during the Qing Dynasty, (Vilo, 2001). Daniel Nadler lives in New York City with his Iranian-born wife Serga. Their new book is called Ethnic Adornments: A Survey of Silver Jewelry.